Is an iPhone worth 8 Nokia phones or 2 Blackberries? 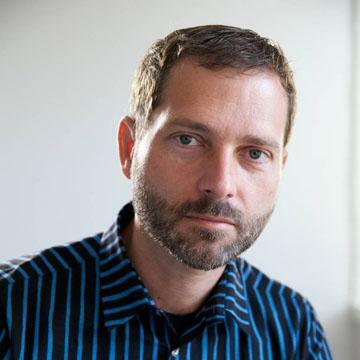 Pricing is a leading indicator of value. Some might argue price and value are often out of whack but, in the long term the two converge. So it’s instructive to measure how a vendor creates value by what it’s able to charge for its goods. In the case of mobile phones, price is summarized by something called ASP (average selling price) which is measured each quarter across a vendor’s entire portfolio. Again, there might be local fluctuations, but the trend is your friend here. Take a look at these charts I prepared based on the group of seven vendors I previously analyzed in terms of their sales and volume performance. First, a history of pricing since Q2 2007. All figures are in US dollars current as of time of reporting. 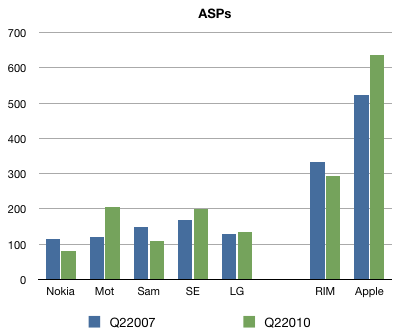 Here we see the ASP erosion inherent in the large incumbents with Nokia and Samsung both seeing price slides. LG went through a phase of price growth but has returned to a point near to where it started three years ago. While Sony Ericsson and Motorola were following the downtrend until 2008, they reversed and began an ASP climb while fleeing upmarket (at the expense of volumes). 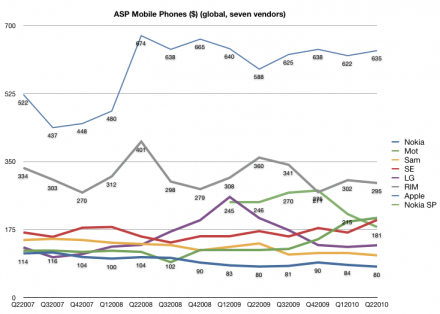 Finally we have RIM and Apple both holding the line on pricing while growing volumes. Not only are the lines steady (with Apple slightly increasing and RIM slightly decreasing) but they are way above their competitors; Apple’s shockingly so. During the three year window we’re looking at, Apple and RIM showed ASP durability while incumbents showed ASP erosion. Pile these data points on top of the volume and sales data and we can move forward.